Afghanistan is a male-dominated society. It is also a society where authority and power mean a lot. I think that the fact that I am a guest in their country, a foreign woman, representing the United Nations – a respected organization – works in my favour. Afghanistan is very different from my own home country, Sweden, but beyond the surface we are all surprisingly alike. Daily life in Kabul is not very comfortable; I lived in one room for more than a year before I found a small flat in a security-cleared compound. The security situation is very worrying and limits your personal life as well as the work of the United Nations. The suicide attack on a UN convoy in Kandahar province in the south of the country on 14 September, which killed two WHO colleagues, was a terrible blow to all of us. It is getting increasingly difficult and dangerous. Half of the country is at least partially out of reach for us because of lack of security. The costs of operations are going up because of the volatile situation. The mandates of UNODC are manifold – fighting narcotics, organized crime, trafficking in human beings, corruption, and terrorism. I have chosen to be vocal on these issues as a way to raise awareness and not everybody appreciates it. But we cannot work in silence; we have to speak up even if it means a certain risk. It may sound contradictory, but working in Afghanistan has been a wonderful experience. I love Afghanistan, and I hope that the Afghans I work with in my own organization and in the Government feel the sincerity of my affection. If you are willing to broaden your views and perspectives on yourself, see people, be curious about people, listen a lot, be open-minded and approachable, then you have a great time in spite of all difficulties. What is the present scale of the drug industry in Afghanistan? Does the situation differ in any significant way from previous years in terms of cultivation and trafficking illicit drugs? Afghanistan produces over 90 per cent of the world’s opium, the raw material for heroin. Last year the production amounted to 8,200 metric tons, which is double the estimated illegal demand. The production is slightly down this year, to 7,700 metric tons, but still way above what the illegal consumption accounts for. While the Afghan opium prices have fallen lately, the fall is not as drastic as it would be if very large amounts of opium stocks were available on the market. The cultivation of opium poppy has decreased by almost 20 per cent compared to last year. The fact that the decrease in opium production is much less can be explained by the fact that cultivation now is concentrated to the fertile South. Seven provinces in the South and South West account for 98 per cent of the total cultivation of opium poppy. Drastic reductions have occurred in the rest of the country, where there is more government control than in the volatile and insecure South. Ten per cent of the Afghan population is involved in opium cultivation (down from 14 per cent last year) – 2.4 million people as compared to 3.3 million in 2007. The total farm gate value of opium production has gone down from around one billion US dollars last year to around 730 million this year. This is the gross income; close to 40 percent goes to cover costs for seed, fertilizers, labour, etc. Deductions should also be made for bribes and usher, a ten per cent Islamic tax that the Taliban charge in some parts of the South. What are the main routes used by traffickers outside the country? The main routes are through Iran and Pakistan and from there up to the so-called Balkan route. An estimated 20 per cent used to go through Central Asia. It is still too early to say if this is still the case, given the drastic decrease in cultivation in the north part. What are the main advances in drug control in Afghanistan and what are the main obstacles to this? The most important development over the last couple of years is the increase in the number of provinces free of poppy cultivation, from 6 in 2006 to 18 in 2008, which is more than half of all provinces. Also the large decrease in cultivation in a number of provinces in the northern and eastern parts of the country is an accomplishment. 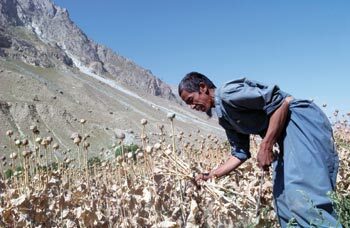 However, since opium poppy is a seasonal plant, this positive development can easily be reversed during next season, if the provinces that have been successful are not recognized and supported with development. A long-term rural development perspective is necessary. Given the severe drought in almost all of Afghanistan (with the exception of the poppy cultivating parts in the South) and the high food prices, short-term aid for food security is also necessary to ensure that farmers do not go back to cultivating poppy out of despair. The high level of cultivation in the southern parts is possibly due to a conducive environment created by an alliance of convenience of large land owners, organized criminal networks, corrupt officials and insurgents. Poppy cultivation will continue to thrive in the South if we do not succeed in breaking up this alliance. 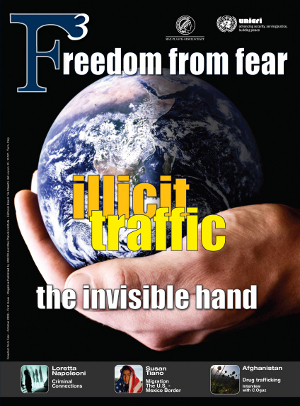 Trafficking and corruption is another barbarous nexus. What are the mechanisms through which corruption has a negative impact on the effectiveness of counter-narcotics measures? Corruption is at the heart of the drug industry. The export value was estimated at four billion dollars last year. It is an enormous amount of money in a country where the GDP is estimated at 8 to 10 billion dollars. A policeman earns 100 dollars a month and can easily get 1,000 by simply turning a blind eye to a convoy of drugs passing by. Powerful people with powerful friends escape justice through “telephone justice”, the practice of making a phone call to request the release of a well-connected person arrested on drugs charges. What are the principal alternatives to poppy cultivation for farmers? Wheat is becoming increasingly profitable. Some years ago, farmers would get ten times more per hectare if they cultivated poppy instead of wheat. Today they get only three times more. If we deduct the labour costs etc, the difference is only 2:1. However, substituting poppy with wheat would require investments in irrigation and in better seeds. Opium has other advantages also, such as easy market access. The market comes to the farmer! Other products have to be transported along bumpy roads and may lose value during transportation. It would also be necessary to diversify and to move higher up the value-adding ladder. Additionally, it is necessary to make credit available to farmers. One advantage of poppy cultivation is that it is easy to get credit against future harvest of opium.